The internet and the social media are having a great impact on market research. Such a powerful platform for talking, listening, disseminating and collecting information couldn’t be seen but as an opportunity by the market researcher. It poses a formidable challenge, though. That of avoiding being buried by the massive amount of information so easily gathered. Ethnographic diaries to obtain detailed information (textual and visual) about respondents’ life style, specific consumption experiences, etc. 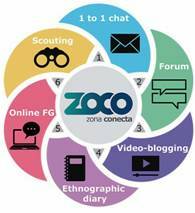 Scouting tasks, in which respondents are asked to browse in the internet or go on safari offline collecting information and visual records about a specific topics.